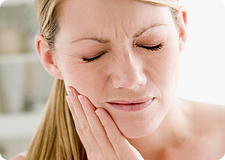 Tooth cavities aren’t uncommon — but with the right dental health know-how, you can help prevent them. It all starts with proper brushing, daily flossing, and fluoride. Get the details right here. Cavities are holes in the teeth resulting from acid attack. They generally start in the enamel, but can spread to the softer inner layer of the tooth. Tooth cavities are caused by decay that can occur when foods containing carbohydrates become trapped between teeth, and are not completely removed with brushing and flossing. Bacteria living in the mouth digest these foods, generating acidic byproducts that can eat away at tooth enamel. Fluoride, which is found in most public drinking supplies, some mouth rinses, and Crest toothpastes, helps prevent tooth cavities by slowing the breakdown of enamel and speeding up the remineralization process. Check with your dental professional to see if your drinking water is fluoridated. If it isn’t, he or she may recommend that you use high concentration fluoride treatments. To help strengthen weak spots in tooth enamel, and help prevent the early stages of tooth decay, brush regularly with a fluoridated toothpaste, floss daily, and visit your dental office regularly for professional cleanings. Posted in dental cavities, general dentistry, oral hygiene care.